le chaudron de vulcain – April 13 , 2018. EN. Ambae , Kilauea , Sinabung , Mauna Loa . April 13 , 2018. EN. Ambae , Kilauea , Sinabung , Mauna Loa . Home / Ambae / April 13 , 2018. EN. Ambae , Kilauea , Sinabung , Mauna Loa . Ambae volcano remains at the Alert Level 3 with sustained volcanic ashes/gases. Villages from West to North West of Ambae island will continue to expect ash fall and gases. Acid rain may occur during rain fall and avoid creeks/steams. Observations of March and early April 2018 confirm that the Ambae eruption style has changed, the volcano emitted more and sustained volcanic ash or/and gases. The presence of accumulated ash that is falling around the volcanic area could change the behaviour of streams and creeks when it rains. The creeks and streams could produce floods and carry a lot more debris (sands, gravel and boulders). The flow path of streams and creeks could change due to the flood debris. Landslide may occur at some areas during heavy rain fall. The Vanuatu Meteorology and Geohazards Department will continue to closely monitor this volcano activity. More information will be provided as available. 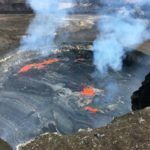 Eruptions continue at Kīlauea Volcano’s summit and East Rift Zone. The summit lava lake remains at a high level, with spattering visible from Jaggar Museum over the past day. A moderate earthquake swarm occurred yesterday below Kīlauea’s summit, though rates have since returned to background levels. 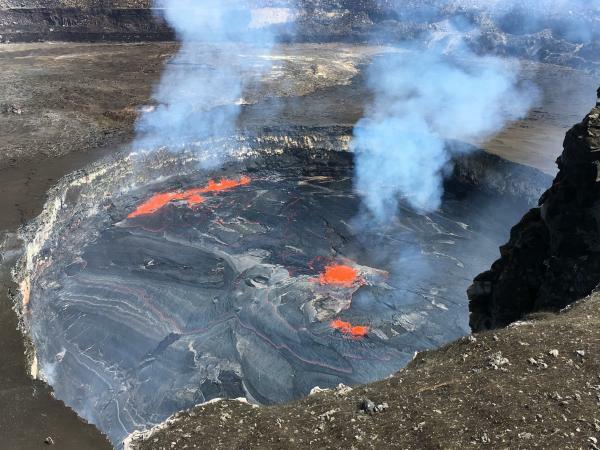 Puʻu ʻŌʻō cone has been inflating and recently produced lava flows on the crater floor. The Episode 61g lava flow is active above Pulama pali and does not pose a threat to nearby communities at this time. There is currently no active lava on the pali, the coastal plain, or entering the ocean. The summit lava lake remains at a high level, with spattering periodically visible from HVO and Jaggar Museum yesterday. 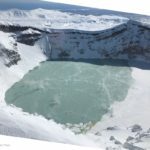 This morning the lake level was measured to be about 32 meters (105 ft.) below the rim of the Overlook crater, slightly deeper than yesterday. A moderate swarm of over 200 earthquakes occurred yesterday at depths of 7-9 km (4.5-5.5 mi.) below Kīlauea’s summit. The largest event in the sequence was a M2.4. Seismicity returned to its background rate at about 2:30 AM HST. Summit tiltmeters are recording small amounts of deflationary tilt this morning, consistent with the deflationary phase of a summit DI event . There was no change detected in deformation data due to the earthquake activity. Elevated summit sulfur dioxide emission rates persist. After two very slight deflation episodes yesterday, inflationary tilt continued to be recorded on Puʻu ʻŌʻō tiltmeters, continuing the inflationary trend of the past several weeks. Webcam views were impeded by poor weather, however no new flows in the crater were apparent in the past 24 hours. The sulfur dioxide emission rate from the East Rift Zone vents has been steady over the past several months and remains significantly lower than the summit emission rate. Recent observations confirm that there is no lava flow activity from the Episode 61g lava flow on the coastal plain and pali. No lava is flowing into the ocean. Lava flow activity on the upper flow field, above the pali and closer to Puʻu ʻŌʻō, continues and does not pose a threat to nearby communities at this time. Areas of the upper flow field with active lava flows are located within the Kahaualeʻa Natural Area Reserve, which has been closed to the public by DLNR since 2007 due to volcanic hazards. Photos : HVO , Bruce Omori. Issued: April 12 , 2018. Hot could avalanches with ash clouds at 09:55 UTC (16:55 local time). The eruption lasted for 115 seconds. Ash cloud is moving to west-southwest. Sinabung volcano is not clear. Seismic activity is characterized by the Deep Volcanic Earthquake, Low Frequency Earthquake, and Hybrid Earthquake. Activity Level of Level IV (AWAS). 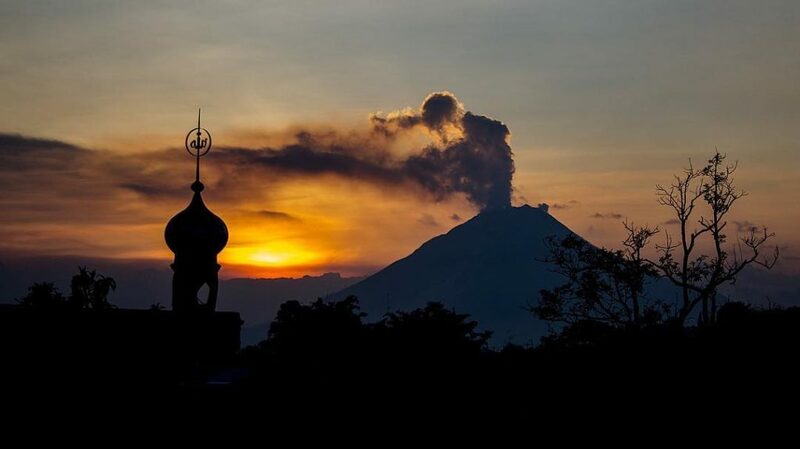 The Sinabung (2460 m altitude) has been erupting constantly since 2013. Since yesterday until this morning, the volcano can be observed visually until the appearance of the fog. Smoke emerging from the crater has been observed to be of low intensity, white, thick, with an average pressure of up to 50 to 300 m above the summit. 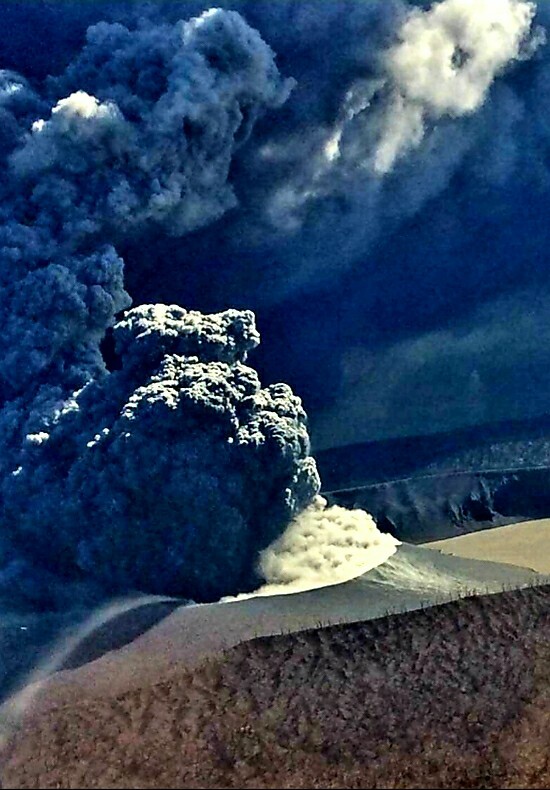 Surface activity is accompanied by eruptions that can not be observed because of fog. The wind is blowing slightly to moderately to the South, West and Southwest. 3 events of non harmonic tremor. Communities / visitors should not do activities within 3 km of the summit, and by sector, 7 km to the South-South-East, 6 km East-South-East and 4 km to the South-East. km northeast. The deposits formed a dam upstream on the Laborus River. People living in downstream river basins and around the Laborus River need to be vigilant because these dams can collapse at any time and no longer retain water volume, resulting in downstream lahars / floods . Source : Magma Indonésie , VSI. Mauna Loa Volcano is not erupting. Rates of deformation and seismicity have not changed significantly in the past week and persist above long-term background levels. During the past week, only a few small-magnitude earthquakes occurred beneath the volcano, primarily at depths shallower than 5 km (3 miles). This aerial view, looking to the northwest, shows Pu‘u Pohaku‘ohanalei on Mauna Loa. This cone is near the 1984 fissure on the volcano’s Northeast Rift Zone. 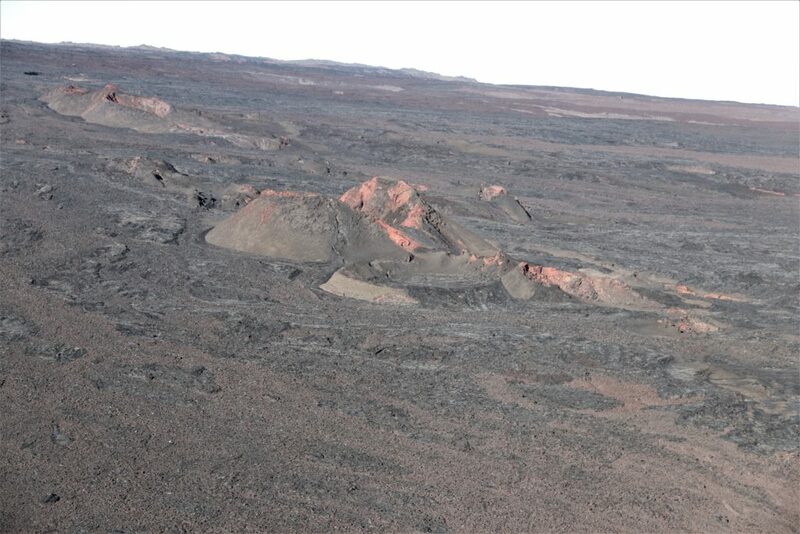 Global Positioning System (GPS) and Interferometric Synthetic Aperture Radar (InSAR) measurements continue to show slow deformation related to inflation of a magma reservoir beneath the summit and upper Southwest Rift Zone. 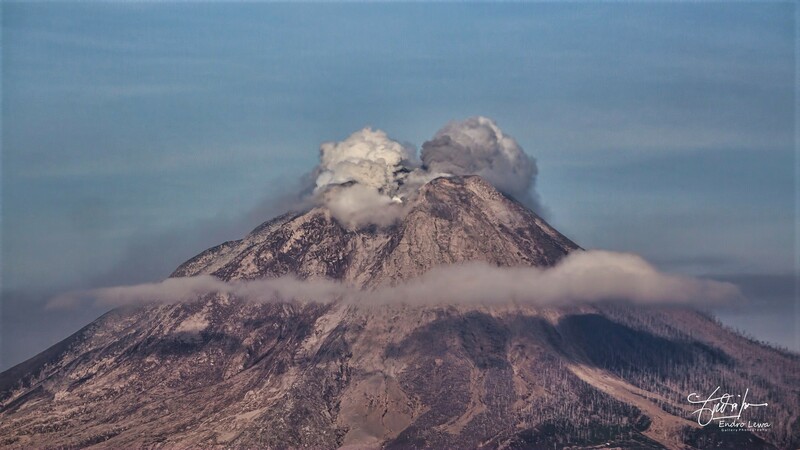 No significant changes in volcanic gas release or fumarole temperature were measured. 13 Avril 2018. FR. 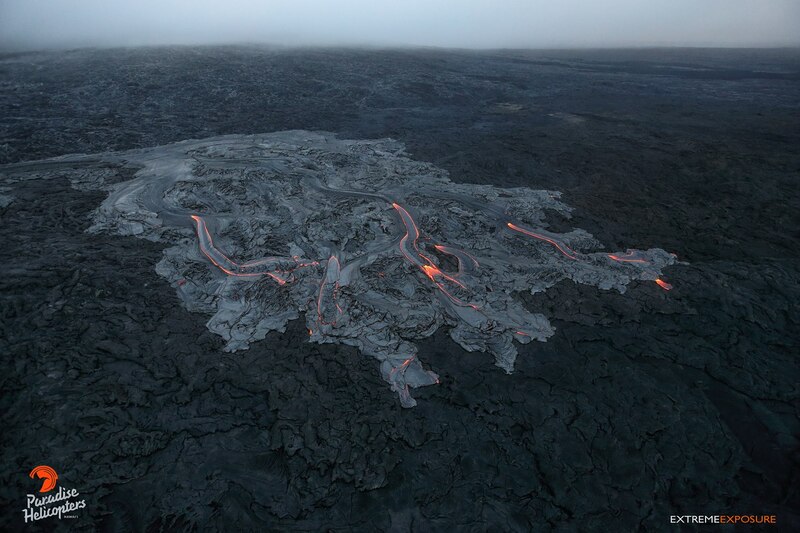 Ambae , Kilauea , Sinabung , Mauna Loa . 14 Avril 2018. FR. Cleveland , Maly Semyachik , Nevado del Ruiz , Turrialba , Poas , Rincon de la Vieja , Dukono .